This is a nice twist on a traditional baked or grilled salmon recipe. 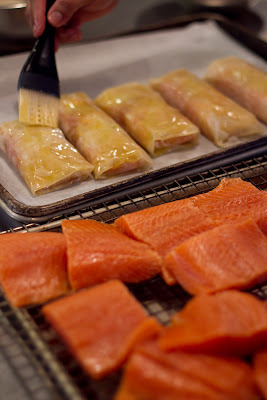 The phyllo keeps the fish extra moist. Our recipe is a take on the Bon Appetite recipe from 1997. Melt 2 tablespoons butter in heavy large skillet over medium-high heat. Add bell peppers and leek and sauté until leek is tender. Cool vegetable mixture. Preheat oven to 400°F. Melt remaining 6 tablespoons butter in small saucepan or microwave. Place 1 pastry sheet on work surface (keep remaining phyllo sheets covered). Brush with some of melted butter. Top with second pastry sheet; brush with melted butter. 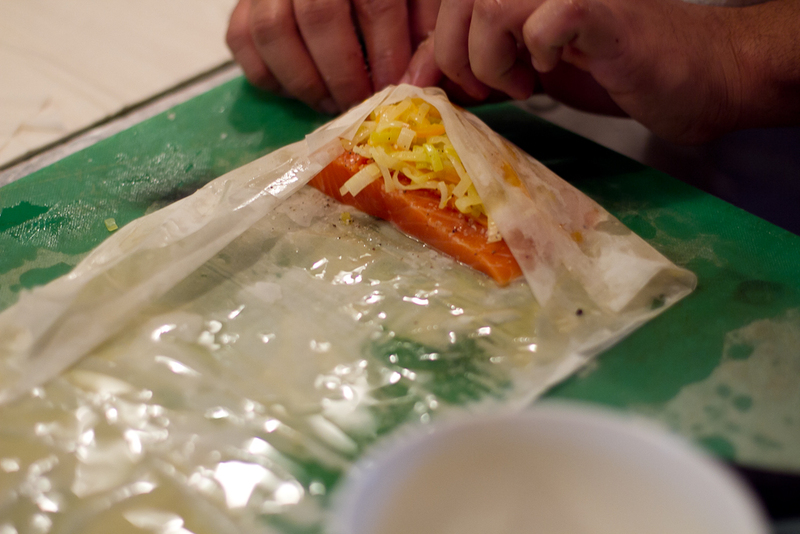 Place 1 salmon fillet crosswise on pastry sheet, 5 inches in from 1 short end. Top salmon fillet with 1/4 cup of vegetable mixture. 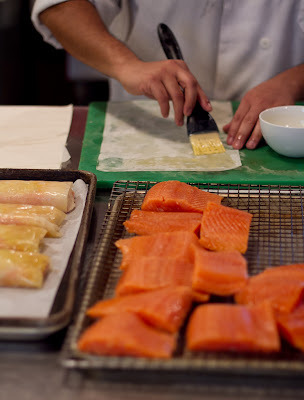 Fold 5-inch section of pastry over salmon. Fold in sides. Roll up, forming rectangular packet. Transfer to heavy large baking sheet, vegetable side up. Brush packet all over with melted butter.